Documentary mini-series exploring the wild west of industrial forestry, old-growth logging, the ancient forest movement & the fight for sustainable forestry in British Columbia. 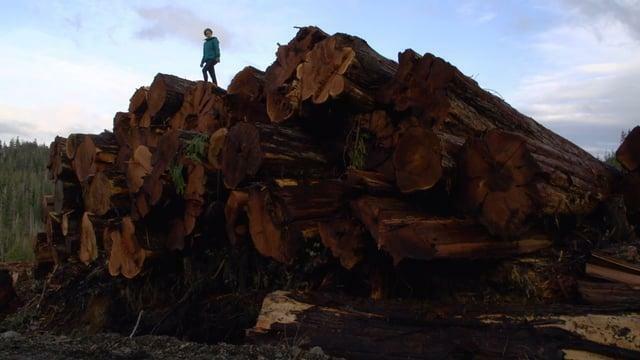 Heartwood is a multi-platform documentary series that explores the wild west of industrial forestry, old-growth logging, the ancient forest movement and the fight for sustainable forestry in British Columbia. This series reveals the cultural and ecological impacts of industrial logging on the coastal landscape – as well as innovative communities that are attempting to cultivate sustainable forestry operations, healthy forests and resilient economies for generations to come. WATCH PARTS 1 AND 2 OF THE NEW HEARTWOOD MINI-SERIES. In Part 1 of this new 3-part mini-series, we explore the endangered old-growth forests of Vancouver Island. Despite the reality that less than 10% of the prime, low-elevation old-growth remains on the island, these forests continue to be converted into second-growth tree farms, We unpack what the loss of these forests means for biodiversity and for coastal First Nations, who have depended on these ancient forests for their culture and survival since the last Ice Age. We also get a sneak peak of Part 2 (coming soon). Part 2 of this new 3-part mini-series explores BC's unique brand of of industrial forest liquidation, the loss of thousands of forestry jobs, the rise of raw log exports, and the "wild west" of political cash that greases the wheels of government in British Columbia.